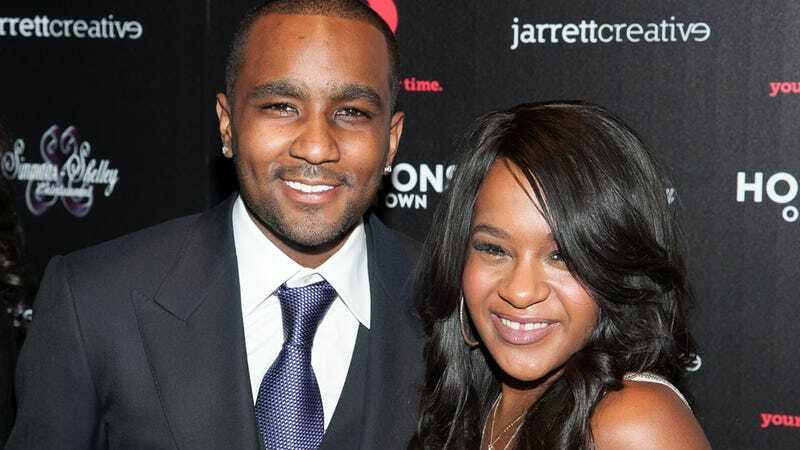 Bobbi Kristina has apparently tied the knot with her longtime boyfriend/non-biological brother Nick Gordon, announcing the news yesterday on Twitter. The 20-year-old daughter of the late Whitney Houston posted a picture of the couple's hands, adorned with wedding rings. "YES, we me nick are engaged. I'm tired of hearing people say 'eww your engaged to your brother or if Whitney was still alive would we be together or would she approve of this. Let me clear up something, we aren't even real brother and sister nor is he my adoptive brother. My mom never adopted him. In fact, mommy was the one who even said that she knew that we were going to start dating. My mom knows me better than any of you." Bobbi's father Bobby Brown made it clear that he did not approve. But Bobbi reportedly has a strained relationship with her dad, and the two don't speak. In fact, after her mother died, she eventually stopped using the last name Brown. Currently her Twitter handle reads: Bobbi Kristina H.G. (for Houston Gordon). Some are questioning whether the marriage is official, since Bobbi has referred to Nick as her "hubby" in the past.